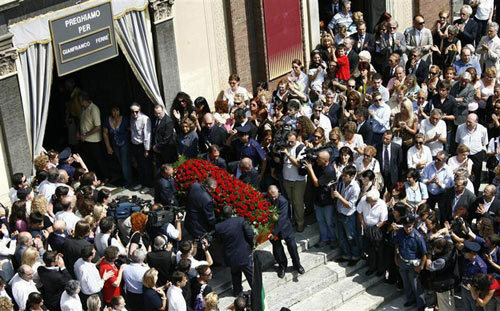 ROME, June 19, 2007 (AFP) -Italian designer Gianfranco Ferre, who died this weekend at the age of 62, was buried Tuesday June 19th in his northern hometown of Legnano in a ceremony attended by his peers and admirers. The service was held at Legnano's basilica where a huge crowd of mourners turned up, including top designers Giorgio Armani, Donatella Versace, Valentino and Ottavio Missoni. Throngs of curious onlookers also turned up to see the coffin, bedecked with roses -- Ferre's favourite flower -- but were not allowed inside. They gathered outside the basilica and followed the Mass from there. Ferre was then buried in the cemetery in the small town, about 30 kilometres (20 miles) from Milan. His parents are also buried there. The designer, whose training as an architect had a crucial influence on his approach to fashion, died Sunday in a Milan hospital after suffering a massive brain haemorrhage. Ferre, who suffered from diabetes, had already had two strokes in the past but managed to recover, without paying heed to medical advice. His international career included eight years as artistic director at the helm of the prestigious house of Christian Dior in Paris. He studied architecture in Milan, qualifying in 1969, although within a few years he had moved over into fashion. But his first love never left him: he has been called "the Frank Lloyd Wright of Italian fashion". The catwalk show of his men's spring-summer 2008 collection will go ahead as planned on Sunday.